Morocco is heating up as a travel destination with visitors and travel bloggers alike, and Marrakech – the cultural hub of the country – is where it’s at right now. In days gone by Marrakech was a hippy mecca, drawing Yves Saint Laurent, The Beatles, and The Rolling Stones to its UNESCO World Heritage old town. Nowadays it’s filled with European tourists, French hipsters, and world travellers looking to explore the Sahara beyond. Here’s our guide to exploring Marrakech in 48hours… but we can’t guarantee that you’ll actually want to leave! You’ve arrived! It’s a long flight from Australia, so after a walk through the old medina to get to your accommodation, check into your riad in Marrakech. We stayed at the gorgeous Palais Sebban, set around a stunning walled garden, pool, and courtyard. Order a pot of traditional Moroccan tea and settle into your room. 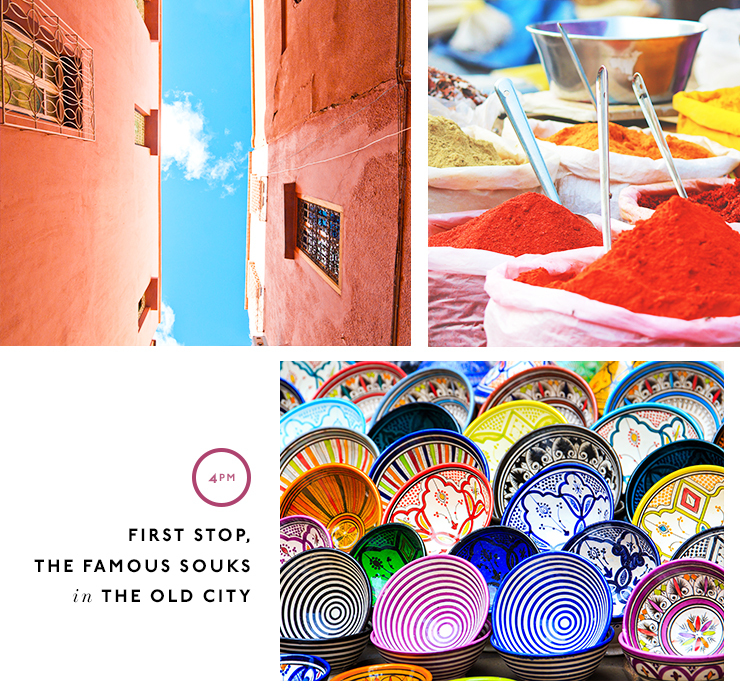 Your first stop in Marrakech has to be the famous souks, or markets, in the old city. Spend some time getting lost in the winding alleys – but don’t get too lost or you’ll never find your way out! Plan to emerge from the souks at the central night market, Jemaa el-Fnaa. Grab dinner at one of the many balcony restaurants above the markets and take in the craziness of the sprawling stalls below. After a traditional tagine, venture into a world of snake charmers and musicians and dance the night away with the locals. One of the worst mistakes you could make is to not spend enough time in your gorgeous riad – so grab a courtyard breakfast in the sunlit garden, accompanied by some strong Moroccan coffee. If you can find a stall on your way out, grab a hot donut freshly fried in oil. It’s your first full day, so it’s time to get touristy. 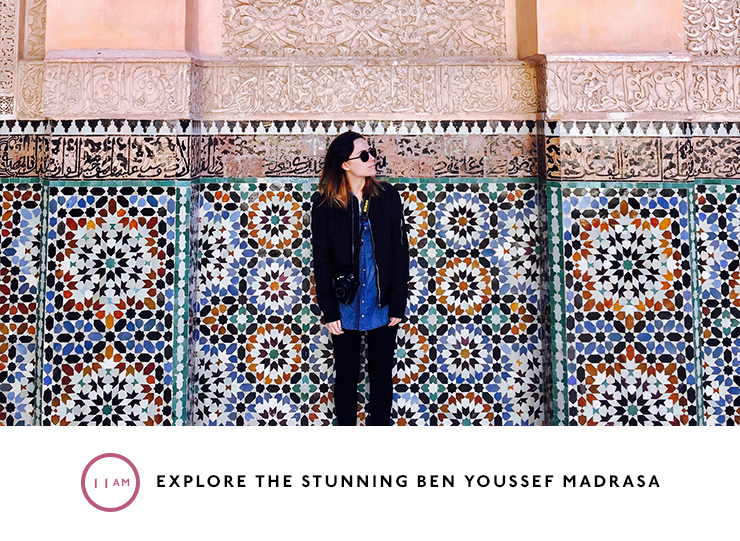 Head to the stunning Ben Youssef Madrasa and while away the morning taking in the intricate detail of the old Islamic college and largest Madrasa in all of Morocco. This is your prime spot for Instagram selfies. Head back into the old town medina and navigate your way through the laneways to the ever-popular Café De Espices. Climb the winding stairs to the terrace at the top and drink mint tea with lunch as you watch the bustling markets in the small local plaza below. Get snap happy at Koutoubia Mosque, then head to Museum de Marrakech to find out more about Moroccan history. 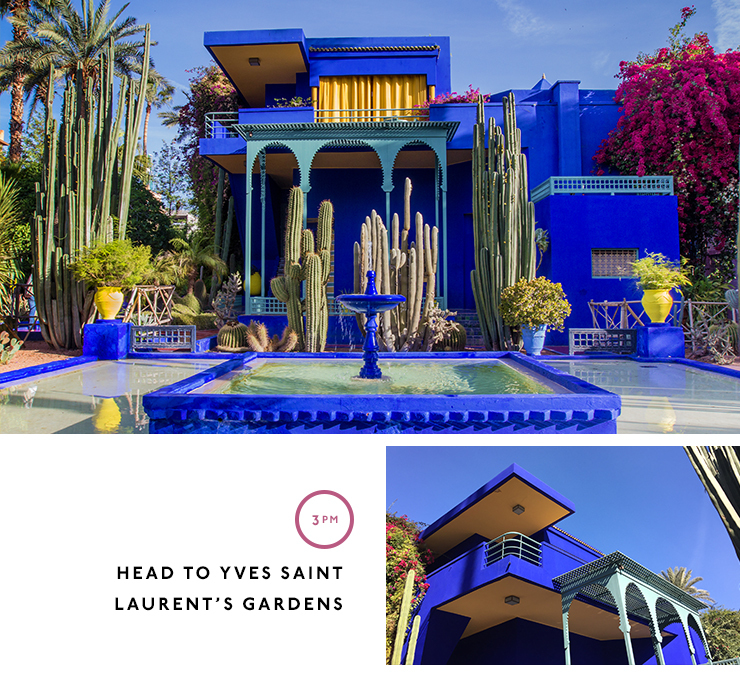 If you haven’t already walked your feet off, pop into Majorelle, Yves Saint Laurent’s gardens. They’re a stunning study in colour, style, and modernity. It’s easy to get overwhelmed by the sights and sounds of heady Marrakech, so we chose to have a quiet dinner at the riad. Candlelight in the cute gardens with (probably) the only wine in town? Sounds like a winner for your final night in the city. If you have the money, and maybe if you don’t, this is the most amazing travel experience you’ll never regret (even when you’re paying off the credit card later). 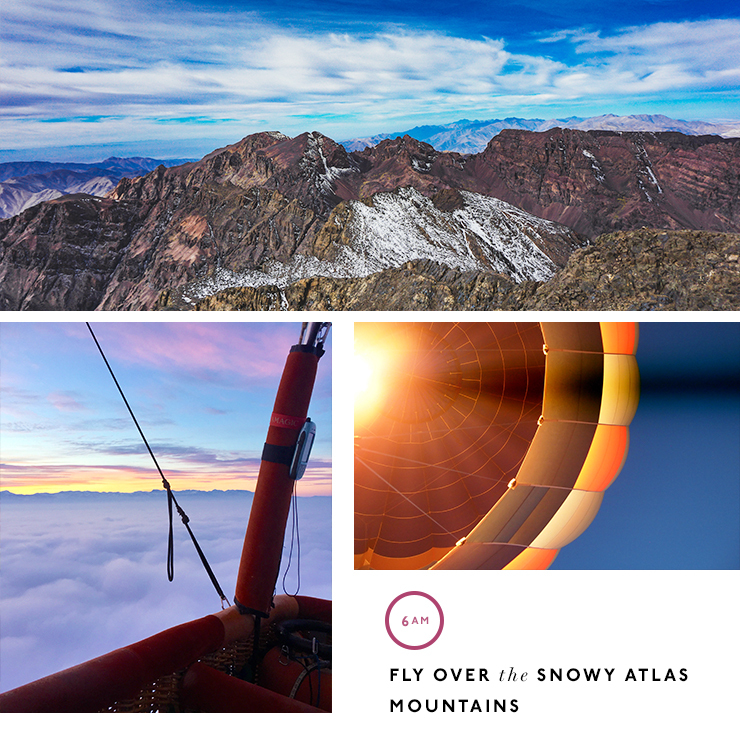 We booked an early morning, private, champagne hot air balloon flight over the snowy Atlas Mountains with Ciel D’Afrique. It was breathtaking. It was stunning. It was pretty much unforgettable. After your hot air balloon flight, take the rest of the bottle of French champs into their pretty, colourful tent set up with a traditional Moroccan breakfast. It’ll be simple, honest cooking, but it’ll be one of the best you’ll have. Spend your final hours in Marrakech getting lost once more in the medina – and pack any last minute market purchases into your bursting bag. The leather work is excellent, as is the copper and silver homeware. June to September sees the hot season temperatures climb to 30degC and higher, and although there’s low rainfall, it’s not the most pleasant thing in the world to walk the medina in crazy hot weather. November sees the most rainfall, which leads into a cool winter through to March (although we were there in January and it was completely manageable, around 13degC). March to May is the best time to visit weather-wise – although be careful of higher rates during Easter. Although Morocco is a primarily Muslim country, you don’t have to wear a headscarf to visit tourist-friendly Marrakech. However, you will get stares if you expose a lot of skin; we recommend long pants, long sleeves and no cleavage – be respectful of the local culture and you’ll have a better experience. For the local experience (and better photos! ), we recommend staying in a riad rather than a hotel – they are gorgeous, old houses generally with a pool in the centre. Bring mostly flat shoes – you’ll be walking a lot. Seek out some great tagines – it’s the dish of Morocco! Take the time during the day to perch yourself in one of the rooftop bars or cafes and drink traditional Moroccan mint tea as the world bustles by below you. Visit Yves Saint Laurent’s garden for some serious garden-envy. Look down: The details on the floor will take your breath away with stunning Moroccan tiles and mosaics. Buy all of the amazing handmade items at the markets – but make sure you come with an empty bag! Depending on what time of year you go to Marrakech, you’ll need to add some warmer items to the below as well… but generally, think light, loose travel clothes that can transition from a carpet shop to sightseeing to a casual dinner. First time in Morocco? Here's everything you need to know.